Born 29.7.1950 Died 12.3.2019 aged 68. Eldest son of Bruno and Maria Antonia (dec). Brother of Pat and Cam. Husband to Anna, father to Bruno, Leo and Antie. Father-in-law to Joya and Adam. Nonno to Sav, Ethan, Kristian, Jayden and Isabella. My Darling Sam, we have been married for 45 years, with 3 amazing children and 5 very special grandchildren that you loved so much. They were so brave till the end. We will miss your laugh, smile and amazing appetite to everything I cooked. Your favourite being scones with jam and cream, angel cake, and many more as long as it had cream. To watch you suffer and become a shell of the man you were hurt so much. We tried so hard to save you, but we couldn't. Life is so cruel and you were so young still. I'm pretty sure if I said let's go on another cruise, you'd be packed and off we go. I will treasure the good and hard times we had together. I will look after the kids and remind your grandchildren that you are watching them. They will make you so proud. Rest now my darling, until we meet again. I wish for one more hug and kiss. Your loving family. Love forever, Anna, Bruno Leo, Antie, Joya, Adam, Sav, Ethan, Kristian, Jayden and Isabella. Our family would like to thank Doctors Cheah and Di Camillo and the amazing staff at Myvista, especially Sam's caring angels Carmen and Nazmin who always made him look and feel good. Please no visits at home. My Dearest Dad, you were taken so early by the cruelest disease. You are now at peace looking over us. The time we had together I will always cherish with the fondest memories. From life on the farm in North Bodallin to life in Perth. There was never a dull moment. I will miss your smile, your laughter and unconditional love and support in whatever I chose to do. I will look out for Mum, my brother and sister and their families. I am proud to call you my father. I will miss you very much. Till we meet again, Your loving son, Bruno. Dad, you were taken so early but you're at peace now. You have always been there for our family. You were the best Dad, Nonno and my hero. I'll always cherish all the great times we had. You never missed a game, sports event or awards and we will think of you with every milestone and achievement and wish you were here as a shoulder when times get tough. Always on our minds, forever in our hearts. May you Rest in Peace. Your loving son Leo, daughter-in-law Joya and grandchildren Sav, Ethan and Kristian. Dad, you were taken too soon from us, but now you are at peace and pain free. We will always treasure the moments we have shared together. We miss you terribly especially your amazing laugh and how you always looked out for us through thick and thin. Thank you for being a great Dad and Nonno. You will be in our hearts forever. Love you always, Daughter Antie, son-in-law Adam and grandchildren Jayden and Isabella. Special Big Brother, best friend and life mentor of Pat and dearly loved and respected brother-in-law of Josie. Sam, you have left us but we will always honour the life values you displayed and we will treasure the wonderful memories you have left us with. We can never forget your laugh that filled a room with happiness. Our time together on holidays, playing cards will always be special. Your love of family, honesty, courage and humility will always be an inspiration. Thank for being one of God's good guys. Our love and thoughts are with Anna, Bruno, Leo, Antie and families. To my beloved brother Sam, you will be truly missed. Our hearts are full of sadness but you have left us with many happy memories. To us you were someone special, someone loving, kind and true. You will never be forgotten, as we thought the world of you. Always in our hearts. Your loving sister Cam and brother-in-law Tony. Sending love and hugs to Zia Anna, Bruno, Leo, Antie and families. Uncle Sam's infectious laugh, table tennis prowess and love for his grandkids (and Elvis) are the memories that will live on and make us smile every day. Our deepest sympathy to Aunty Anna, cousins Bruno, Leo, Antie and families. We will always treasure the wonderful memories of our Uncle Sam. A true gentleman now resting peacefully. Forever in our hearts. Domenic, Melissa, Connie, David and families. The Funeral Cortege for Mr Saverio (Sam) Marafioti of Morley, formerly of Bodallin will arrive at the main entrance of KARRAKATTA Cemetery, Railway Road, Karrakatta at 11.00am WEDNESDAY (20.03.2019) for an Entombment Service at the Mausoleum. Vigil Prayers and Rosary will be recited in St Gerard Majella Catholic Church 37 Changton Way, Westminster at 7.00pm on TUESDAY (19.03.2019). The Funeral Mass will be celebrated after the Rosary, commencing at 7.30pm. To Anna, Pat, Cam and families. Our sympathies on your sad loss. May it comfort you to know so many of us care. Sincere sympathy to Anna and family on the sad passing of Sam, our thoughts are also with Rina and George and respective families. John, Nancy Gentili and families. Heartfelt sympathy to cousins Anna, Bruno, Leo, Antie, Pat, Cam and families. Our prayers and thoughts are with you all. Love Joe, Franca Settineri and family. RIP. Sincere sympathy to Anna, Bruno, Leo, Joya, Antie, Adam and families on the sad passing of Sam. May he now rest in peace. Angelo, Faye, Troy, Melissa, Michael and Daniella Levissianos. Heartfelt sympathy to Anna, Bruno, Leo, Antie, Pat, Cam and all families. Our thoughts and Prayers are with you. Eternal rest Sam. Bruno, Sue and family. Much loved and respected cousin of Grace and Don, Annette and Michael and families. Our sympathy to Anna, Bruno, Leo, Anti and families. Pat, Cam and family. Sam the smile on you face when you beat your big brother at golf will remain with us forever. Rest in peace. Heartfelt sympathy to our dear cousin Anna and family. Sam was taken too soon and will be remembered always. R.I.P. Teresa and Vince, Mimma and Vince, Rina and Michael and families. 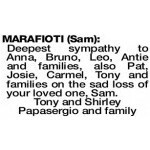 Heartfelt sympathy to Carmel, Tony and all the Marafioti Families on your very sad loss. Aunty Rosa, Mary, Josie, Nato and families. Our deepest sympathy to Anna, Bruno, Leo, Joya, Antie, Adam, Pat, Pina and all the Marafioti families. Memories are threads of gold, they never tarnish or grow old. Rest in peace. Aunty Mary, cousins Joe, Pat, Anthony and families. Sincere condolences to Anna, Pat, Carmelina and all Marafioti families. Deepest sympathy to Anna, Bruno, Leo, Antie and families, also Pat, Josie, Carmel, Tony and families on the sad loss of your loved one, Sam. Heartfelt sympathy to Pat, Pina and families. Fond memories of Sam, our love and thoughts are with you. Frank, Jan Zoiti, Phil, Tony, Pauline (dec) and families. Our heartfelt sympathy to Anna, Bruno, Leo, Antie and families on the loss of your loved one. Sleep peacefully Sam. Tony, Grace, Pep, Phil, Gambit and families. Our deepest sympathy to Anna, Bruno, Leo, Antie and families, Pat and Josie, Carmel and Tony and all respected families on the sad loss of your loved one. MARAFIOTI SAM Our deepest sympathy to Anna, Pat, Pina and all Marafioti families on the sad passing of Sam. Deepest sympathy to Anna and family on your sad loss of Sam. Also to George and Rina and Marafioti families. Now at peace. Domenic and Lucy Scutti and family. Deepest sympathy to Anna, Pat, Cam and families. RIP Sam. Charlie, Angie Versace and family. Saverio SAM Deepest sympathy Comare Anna, Pat Pina Carmel Tony and families. Compare Sam will be sadly missed. Frank and Maria Bevacqua. 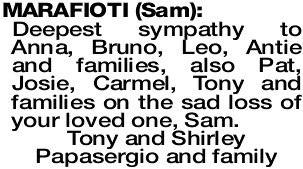 MARAFIOTI SAM Our deepest sympathy to Comare Anna, Bruno, Leo and Antie and families on the sad passing of Compare Sam. God Bless. Love Cosimo Demarte, Carlo and Jenny Varone, Daniel and Lena Ognenis. 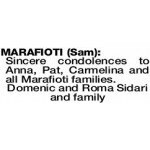 MARAFIOTI SAM Our deepest sympathy to all the Marafioti families and cousins Carmel and Tony Macri on your sad loss. Our sincere condolences to the Marafioti family. May Sam rest in peace. From the Board, Management, Residents and staff at Myvista.